For some time now forms of materialism and realism have been haunting intellectual and cultural discourse, posits the new volume of essays Realism Materialism Art (RMA). The central tenet is that thought can think outside itself, it is held; reality can be structured independent of human consciousness. The editors could not have pinpointed a stronger trend: witness the bevy of exhibitions and seminars on the return of the object and its changed relation to the (in)human including: The Real Thing, Tate Britain, London, 2010; Speculations on Anonymous Materials, Fridericianum, Kassel, 2013–2014; and the series Posthuman Glossary, BAK, basis voor actuele kunst, Utrecht, 2015. 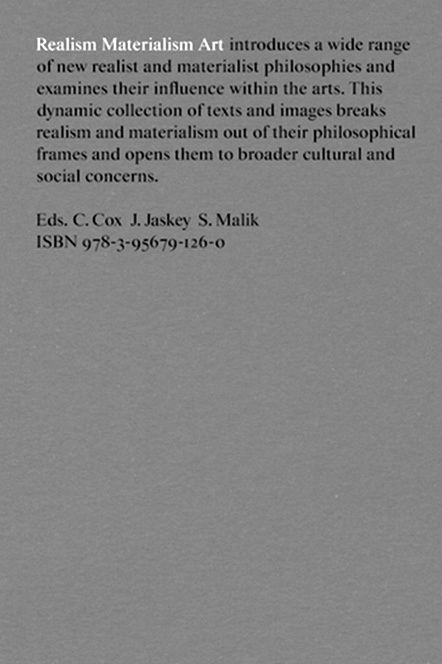 Further, books and magazines have increasingly been dedicated to the challenges new materialist and realist stances present, counting the initiatives of Robin Mackay’s publishing house Urbanomic and its journal Collapse: Philosophical Research and Development among the most influential. Regardless of their design, the positions of the different projects concerned with the subject are often firm and inspiring, and a relief after the last decades’ reigning theoretical premise: that nothing exists outside discourse and its socially organized construction. RMA intends to introduce the variety of realisms and materialisms that often go under the heading of “speculative materialism.”1 The “art” of RMA’s title is comprehended as a “method for convening and extending” realism and materialism. Our question is how the editors conceive what they understand as a new position of art. RMA is composed of thirty-five essays divided into six chapters: Matter, Object, Concept, Representation, Scale, and Speculation. While the themes function as a navigational device, the relations between them contest this categorization. For example, an interview with philosopher Graham Harman (Object) converses with philosopher and novelist Tristan Garcia’s contribution (Representation), both writers arguing for a productive force immanent to artworks, whether as representation (Garcia) or “art object” (Harman); philosopher François Laruelle’s work (Concept) is intent on using philosophy as a material instead of as a form of commentary, a framing device, its stance being picked up on in artist Amanda Beech’s essay that appears in Representation. Beech draws on Laruelle’s writings such as the acclaimed Photo Fiction, a Non-Standard Aesthetics (2012) pleading for an art that is interrogative, traversing categories, much like Laruelle’s writing does, trying to unify poetry and philosophy. For Beech, art should not be justified by either what she perceives as art’s Duchampian paradigm or an aesthetical prerogative. The theoretical questions and references returning in the various essays are both different and shared, in other words. The rhizomatic diagram that opens and closes RMA mapping the linkages between the contributions is in its place. Artist and writer Trevor Paglen, for instance, points to the contradictory functionings of the satellite EchoStar XVI, designed to continuously transmit pictures on innumerable television channels, but also containing a disc in which one hundred pictures is embedded, to last for billions of years. Time is reshaped on a planetary scale here, while it is synchronized with a historical conception of it, acknowledging a distant future surpassing limits that can be rationally conceived. What becomes clear while reading RMA’s diverse essays is that the new realisms and materialisms it discusses intend to present alternative methods opening up new fields of inquiry. Next to the compact of labour and technology (Wark), and science (Ladyman, Meillassoux), art offers these possibilities. This is not new in itself, as the historical avant-gardes, for instance, have demonstrated before. Contemporary art’s status vis-à-vis recent scientific insights has to be redetermined, however. There is “reason to destroy contemporary art,” as one of RMA’s editors Suhail Malik polemically argues, since all contemporary art is correlationist, equating thinking with being, subject with object. Whereas contemporary art relies on the “co-constitution of art object and (sometimes) human subject” after Conceptual art, the latest scientific findings, in which the realist variant of speculative realism is grounded, force one to disconnect the two. Witness the example of Paglen. Malik’s co-editor Christoph Cox challenges this line of thought proposing not an art modelled on science or philosophy, but a sonic philosophy. Cox opts for a sound art that runs parallel to and sometimes diverges from Conceptual Art on which contemporary art is largely based. Sound’s existence independent of objects affirms an ontology of flux, he argues: sonic changes “happen,” regardless of objects. These changes are called events or effects, in analogy with sound effects. Approaching current materialisms and realisms in their various methods and forms, RMA can be called the “primer” on Speculative Realism indeed. Gathering different standpoints within SR, without exhausting them, it lends credence to the philosophy’s opponents as well. SR’s case is defined more acutely in this manner: traditional philosophy has been unable to sever the ontological from the epistemological; scientific innovations and models direct the way, out of the impasse. Especially when concentrating on the position and functioning of art within SR, one has to conclude that SR contains a renewed debut of an ongoing debate concerning the relation of art to life. However, the fact that life has drastically changed in recent years – these changes being not unrelated to scientific inventions – SR urges art to consider alternative artistic methods, modes and techniques. Established paradigms are rethought. Inevitably affected by these concerns, RMA inspires reflections on both life and art as acts. 1. After the workshop entitled “Speculative Realism,” gathering philosophers Quentin Meillassoux, Graham Harman, Ray Brassier and Iain Hamilton Grant at Goldsmiths, University of London, 27 April 2007. 2. Quentin Meillassoux, After Finitude: An Essay on the Necessity of Contingency, trans. Ray Brassier (London: Continuum, 2008), 5.